The Big Picture The Big Picture | Fed's Folly: Fooled by Flawed Futures? Was it a misunderstanding of their mandate, inexperience, or just plain hubris? Regardless, it took only 2 days to learn just how ill-considered the Fed's emergency market rescue plan was: To wit, a fraudulent series of losses led to a major European bank unwinding a huge trade: Societe Generale Reports EU4.9 Billion Trading Loss. SG's $7.1Billion dollar unwinding led to panicked futures selling on Monday and Tuesday. Hence, we quickly learn what sheer folly and utter irresponsibility it is for the Fed to use its limited ammunition to intervene in equity prices. Their panicky rate cute were not to insure the smooth functioning of the markets, but rather, to guarantee prices. As we have been saying for the past two days, this is not the Fed's charge. They are supposed to be maintaining price stability (fighting inflation) and maximizing employment (supporting growth) -- NOT guaranteeing stock prices. I guess the European Central Bank has it easier: Their only charge is to fight inflation: "maintain price stability, safeguarding the value of the euro." Tuesday's panicked 75 basis cut will prove to be an historical embarrassment, a blot on the Fed for all its days. Failing to understand what their responsibilities are is bad enough; allowing themselves to be bossed around by Futures traders is inexcusable. And, having been rewarded for their past tantrums, the market will now be screaming for another 75 bps next week. 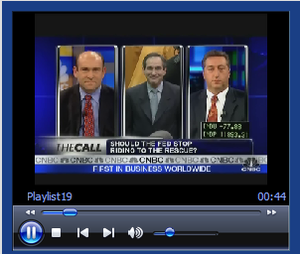 As Rick Santelli appropriately observed, the Pavlonian training is now complete. Too bad we didn't know this during yesterday's Fed debate . . .
WSJ, January 24, 2008 9:40 a.m.
SocGen told Bank of France. So the ECB knew and so did the Fed, in all probability. They went ahead anyway. What a bunch of sellouts. This is not the way monetary policy is supposed to be run. If they cut next week as well, it will confirm that we are a Zimbabwe style monetary policy regime.